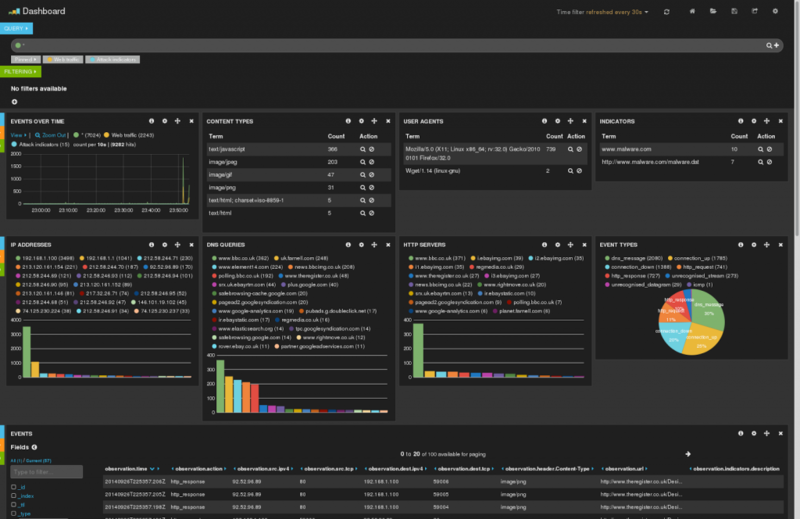 Cyberprobe is a distributed software architecture for monitoring networks under attack. It consists of two components: cyberprobe, which collects data packets and forwards them over a network in standard streaming protocols; and cybermon which decodes protocols, and invokes user-defined logic on the decoded data. Cyberprobe can be integrated with snort so that the captured data corresponds with an attackers IP address as detected by snort. Cybermon uses a LUA configuration file to describe what to do with the decoded information, providing great flexibility. Cybermon also supports a couple of packet injection techniques, allowing you to respond to attacks by resetting connections, or forging DNS responses. a probe, which collects data packets and forwards it over a network in standard streaming protocols. a monitor, which receives the streamed packets, decodes the protocols, and interprets the information. These components can be used together or separately. For a simple configuration, they can be run on the same host, for more complex environments, a number of probes can feed a single monitor. For more detail, and to see where we are going, read the architecture page. The probe can be tasked to collect packets from an interface and forward any which match a configurable address list. The probe can be configured to receive Snort alerts. In this configuration, when an alert is received from Snort, the IP source address associated with the alert is dynamically targeted for a period of time. In such a configuration, the system will collect data from any network actor who triggers a snort rule and is thus identified as a potential attacker. The probe can optionally run a management interface which allows remote interrogation of the state, and alteration of the configuration. This allows dynamic alteration of the targeting map, and integration with other systems. The probe can be configured to deliver on one of two standard stream protocols. Collects packets delivered in stream protocols. Decodes packet protocols in and raises events in near-real-time. Decoded information is made available to user-configurable logic to define how the decoded data is handled. A simple configuration language is used (LUA) and example configurations are provided to monitor data volumes, display data hexdumps, or stash the data in files. Packet forgery techniques are included, which allow resetting TCP connections, and forging DNS responses. This can be invoked from your LUA in order to fight back against attacks on your network. Has a pub/sub delivery mechanism with subscribers for ElasticSearch, Google BigQuery and Gaffer graph store. Supports IP, TCP, UDP, ICMP, HTTP and DNS protocols, currently. The cybermon software includes some support for STIX as a threat indicator specification, and can create alerts on the presence of threats on the network. The easiest way to learn about the software is to follow our Quick Start tutorial.